THE STORY - Bitten by a radioactive spider, teenager Miles Morales suddenly develops mysterious powers that transform him into Spider-Man. He must now use his newfound skills to battle the Kingpin, a hulking madman who can open portals to other dimensions. THE GOOD - Bold storytelling, thrilling action, dynamic animation, meta humor delivered by wonderful voice talents, this Spider-Man film has it all and ushers in a new era of storytelling not just for the character but for the genre as a whole. THE BAD - Some may be put off by the film's bright, colorful and quickly paced animation. ​​​One of the great things that Spider-Man, in all of his incarnations for the big screen, has taught us is that "Anyone can be a hero." As a symbol, Spider-Man was meant to inspire the good citizens of New York (his friendly neighborhood if you will, standing in for the entire world) to rise up and be a hero just like him. However, after many films and depictions, "Spider-Man: Into The Spider-Verse" does something truly groundbreaking, miraculous and truthfully brilliant. It embodies that message, turns the superhero genre on its head and breaks down a door where gender, race and other divisions simply don't matter anymore. Anyone can truly be Spider-Man and the storytelling possibilities for the superhero genre are now endless which could give this tired and worn out genre the shot in the arm for creative new storytelling possibilities moving forward. Miles Morales-Davis (Shameik Moore) is a half-Puerto Rican and half-African-American teenager, who has recently entered into a new high school in Brooklyn New York much his displeasure. His New York Policeman father (Brian Tyree Henry) desires to see that his son succeeds and does not become like his gangster estranged uncle Aaron (Mahershal Ali). However, one night, Miles gets bit by a radioactive spider, much like Peter Parker did many years ago and then eventually became the hero known as Spider-Man. Miles begins to develop the same powers as Spider-Man and eventually stumbles onto a secret plot by crime lord Wilson Fisk aka. "Kingpin" (Liev Schreiber), which opens up a hole in time and space, bringing together various incarnations of the Spider-Man character (stay with me here...) from alternate dimensions into the present day timeline. 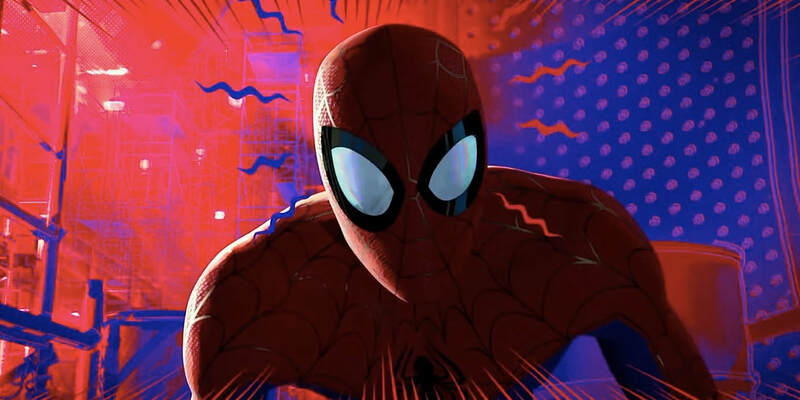 Those versions of the character include an older out of shape Peter B. Parker (Jake Johnson), an anime female version known as Peni Parker (Kimiko Glenn), a black and white fedora/coat wearing brooding version called Spider-Noir (Nicolas Cage), an animated cartoon tiny pig called Peter Porker / Spider-Ham (John Mullaney) and a teenage female version simply known as Spider-Woman aka. Gwen Stacy (Hailee Steinfeld). Still trying to get used to his powers, Miles wants to help the others get back to their dimensions and stop Kingpin but his inexperience as the newest Spider-Man may put him and those he cares about at risk. How fitting is it that, it's in the realm of animation, where Spider-Man was originally conceived as a cartoon, that the web-slinging hero receives a re-birth for a new generation? The concept of "Spider-Man: Into The Spider-Verse" much like "X-Men: Days of Future Past" finds a creative way to course correct where this character has gone and usher in a new era of storytelling possibilities from an entirely new perspective. It feels fresh, exciting, progressive and bold in its decision but it's the wonderful voice talent of Shameik Moore and gorgeously computer animated style which breathes life into the film. Credit must also be given to Phil Lord and Rodney Rothman whose screenplay is a bit whacky at first but is filled with enough humor, humanity and self-aware meta-commentary on the character which doesn't betray our trust nor our intelligence. The animation in "Spider-Man: Into The Spider-Verse" is, much like "The Lego Movie," colorful, dynamic, breathtaking and filled with enough eye-popping moments that you spend half the time wondering "How did they pull this off?" The action sequences (of which, there are many) are fast, well choreographed and never feel dizzying to the eye. It's also well paced and perfectly acted by the many wonderful voice talents including Hailee Steinfeld, Mahershala Ali, Jake Johnson (who has so many zingers), Liev Schreiber, Brian Tyree Henry, Luna Lauren Velez, and Lily Tomlin as a badass version of Aunt May! Literally, everyone does a phenomenal job and much of that is owed to the wonderful writing their characters are given. While it may be yet another superhero origin story, "Spider-Man: Into The Spider-Verse" gets so many details right about the character that it will surely please those who have seen all of the previous films and have read the character's many adventures in the comics. Without giving too much away, I cannot begin to describe to you how exhilarating and exciting this movie is not just for the character Spider-Man but for the superhero genre as a whole. To see a person of color and women portray Spider-Man on screen opens up so many possibilities for the future with other superheroes from other film franchises and one has to even wonder if this will translate into the live-action Spider-Man films at some point. Either way, the fact that "Spider-Man: Into The Spider-Verse" not only exists but succeeds in its storytelling ambitions is nothing short of a cinematic achievement that deserves to be celebrated.